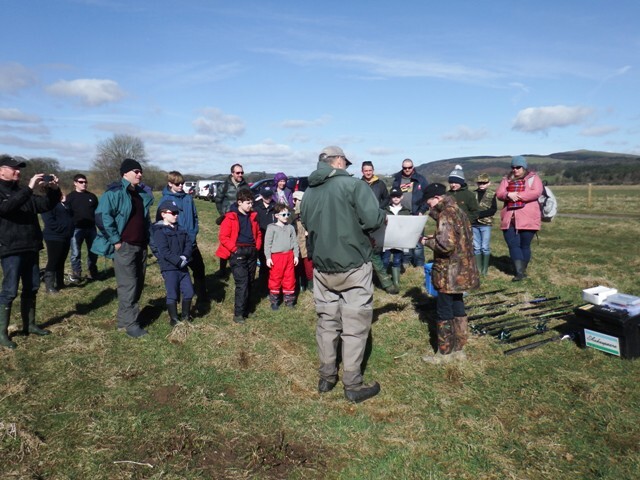 It was the first outing for the Nith Young Anglers Club for 2018 fishing for Grayling at Dalswinton Estate, Dumfries. A bright and sunny day and a very good turn out of juniors accompanied by their parents. The river had a slight tint of colour but was dropping off and clearing. 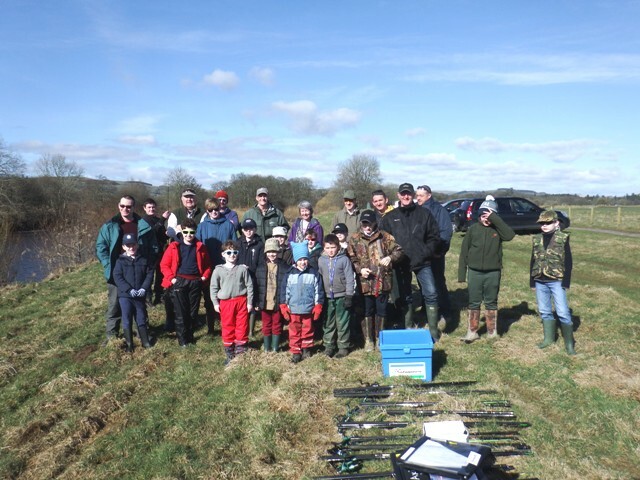 Organised by the Nith Catchment Fishery trust and working with Borderlines This is the second year of the initiative that has proved to be successful into getting young people and indeed the parents out and about on the rivers and still waters of the river Nith catchment. The health and safety talk that every session is started with was conducted by young and very accomplished Andrew with Clive Mitchelhill as his assistant. Derek Kelly again with the help from Andrew gave a demonstration of how to set up rods and rigs for both float and swim feeder tactics. After which each participant set their own rods up and after a quick lunch began fishing. 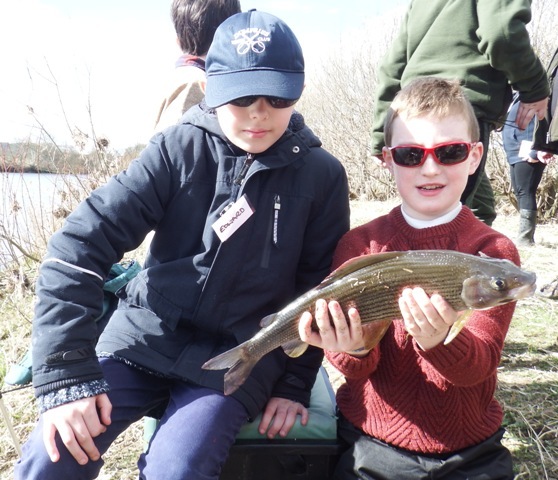 The fishing was a little slow, but first success of the day was Daniel with this superb grayling at around two pounds, a magnificent fish to start your fishing career with! 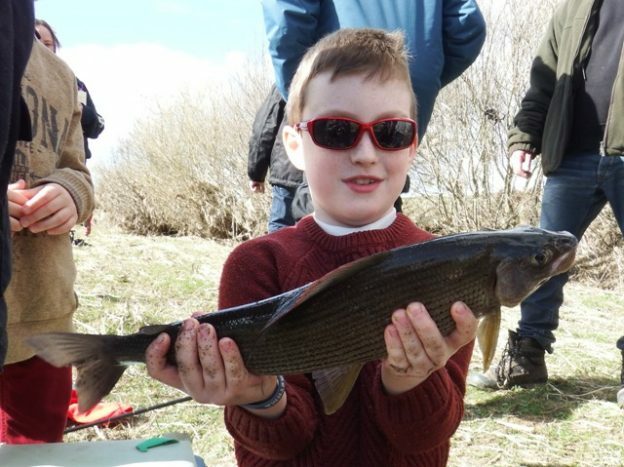 There was another fabulous grayling caught toward the end of the day by Benji. A big thank you to Peter Landale and Andrew of Dalswinton Estate for the use of the very picturesque beat which has some fantastic water to fish! 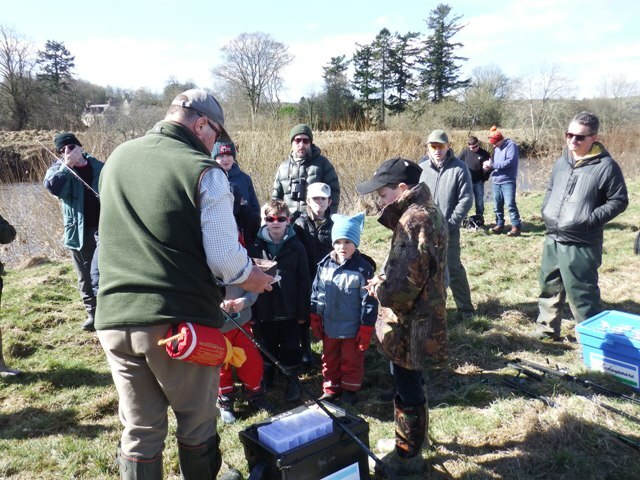 The Nith Catchment Fishery Trust is holding an Angling Taster Day on Wednesday 4th April at Drum Loch, Dalswinton. This is a free event for anyone who is interested in learning more about fishing. Our professional angling instructors will teach participants how to fish for Rainbow trout on a still loch near Dumfries. We provide all of the equipment so all you have to do is turn up in warm, waterproof clothing. Please see attached poster for further information and feel free to distribute it to anyone you think would be interested. Places are limited so please contact me on 01387 740 043 or at trust@river-nith.com to book your place. We will be running two more Taster Days over the summer holidays. 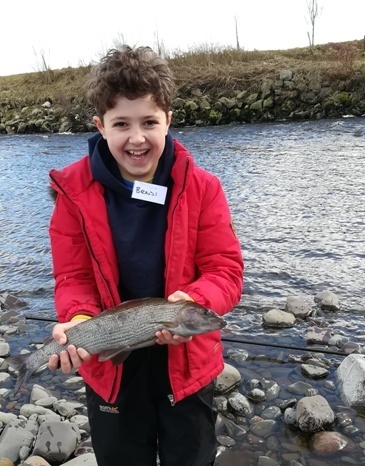 This entry was posted in Borderlines, education, environment, fishing, River Nith, Schools, Scotland and tagged anglingforall, Borderlines, coarse fishing, education, environment, family, funding, outdoors, River Nith, youth on 26th March 2018 by Glyn Freeman.